by April 19 to reserve your spot! 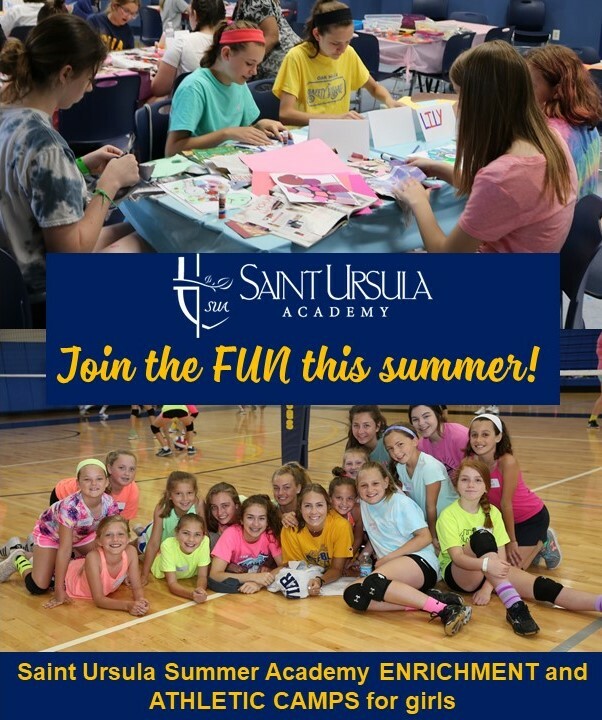 The Saint Ursula Summer Academy will again be offering enrichment and athletic camps for girls! To see camp descriptions or to register, please click HERE! This day long program allows students entering the 8th grade to experience the excitement and activity of a Saint Ursula education! Bring your friends and imagine yourselves at the Academy next fall! Parents are invited to a special coffee and Q & A session from 9 - 10 a.m. The shadow program allows 8th grade girls to attend a day of classes with current students. See how the Tablet PC is used in class, check out the lunch room, meet future teachers and be a Bulldog for the day! Meet teachers from our Education Services Program and find out how Saint Ursula supports students with identified learning disabilities. Faculty, counselors, Admissions staff and administrators will be on hand to answer your questions. This program does not include a formal presentation, so feel free to stay the whole time or stop in for a few minutes. This session will include an overview of the financial aid application process, the FACTS tuition payment and aid application system, and Q&A with Business Office staff. Take an in-depth look at all Saint Ursula Academy has to offer. Classrooms will be open with our distinguished faculty engaging you in a 21st century education! No RSVP necessary. This one day overview course for girls in the 8th grade will allow them to learn test-taking tips, review content of the High School Placement Test, familiarize themselves with the test format, and increase confidence. 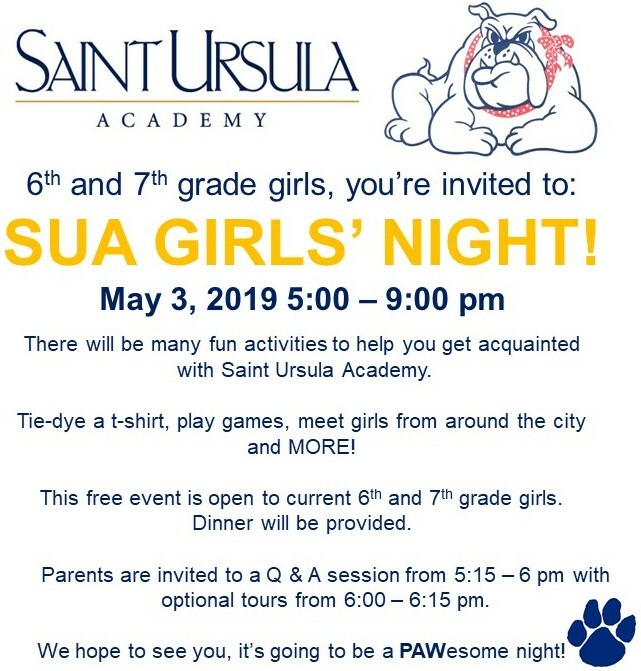 These two hour programs for 7th and 8th graders and parents will “showcase” the many parts of the Saint Ursula education. Get inside information on academic programs, extracurricular activities, community service, and college guidance. 8th grade girls, come see our SUA fall production dress rehearsal. Tickets for this event are half price ($5) and the evening will include a pizza dinner in our Keller Student Center from 6:00 - 6:30 pm. Tickets are limited to two per student and are on a first come, first served basis. Girls in grades 6 - 8 are invited to celebrate diversity and be empowered to be her own self! This retreat will include a variety of community and skill building activities. Registration is limited. All 8th grade girls must take the High School Placement Test to apply to Saint Ursula Academy. We host a test site and accept test scores taken at any Catholic school in the city. Meet girls from all over the city who love to learn and support one another, guided by nurturing teachers who are invested in students’ success. Experience the depth of our courses through the extended class time in our 4-bell collegiate block schedule. Walk through our beautiful campus, going outside between classes to switch from building to building. Shadow days are offered on most school days between September 9 to December 6, 2019. Scheduling for Shadow Days will begin in August 2019. If you have questions about your shadow day or how to schedule, please contact Tricia Reisman, Assistant Director of Admissions, at treisman@saintursula.org or 513-961.3410 ext. 215. © 2019. All Rights Reserved. Saint Ursula Academy.